Healthy Easy Sprouted Bread Recipe | So YUM! 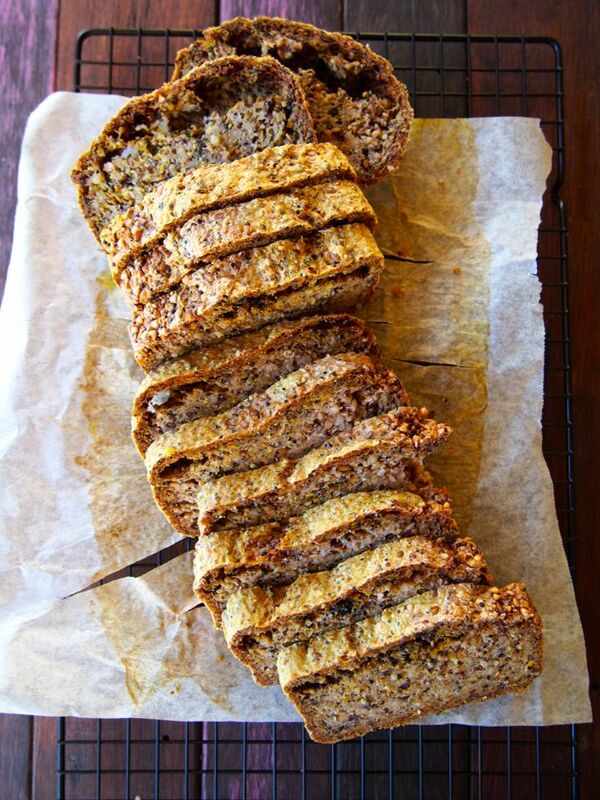 Healthy Easy Sprouted Bread Recipe That Tastes AMAZING! We have been seriously digging sprouted bread. We’ve made this loaf again and again, trying to get the recipe PERFECT for you guys! And we totally did it! Can we get a yay?! This means crunchy bread with soup, toasted sandwiches, open grills, almond butter on toast are all BACK. ON. THE. 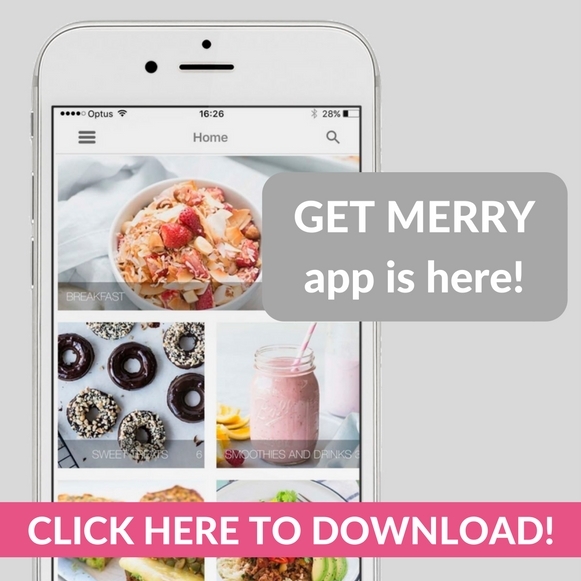 MENU! Not every day menu (for us) but like once a week menu! 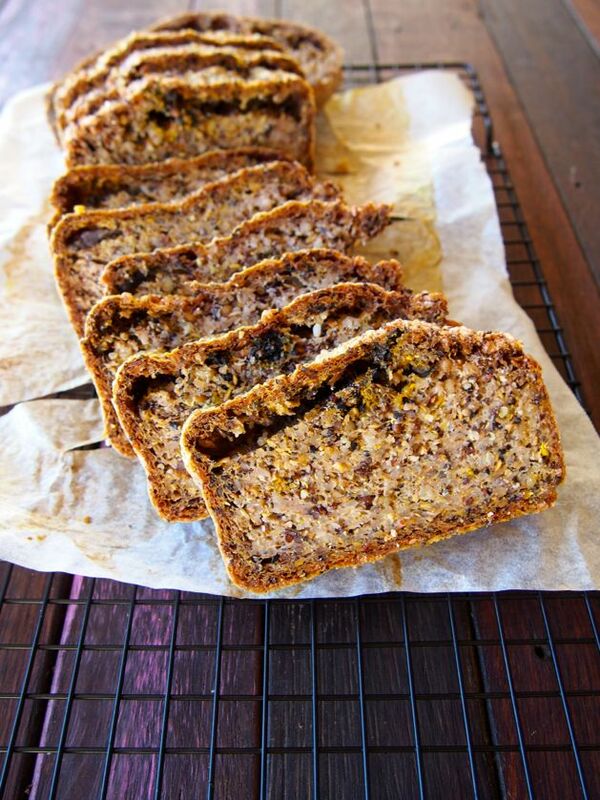 This Healthy Easy Sprouted Bread Recipe uses buckwheat, quinoa and linseeds (we use the Honest to Goodness brand from Supabarn! 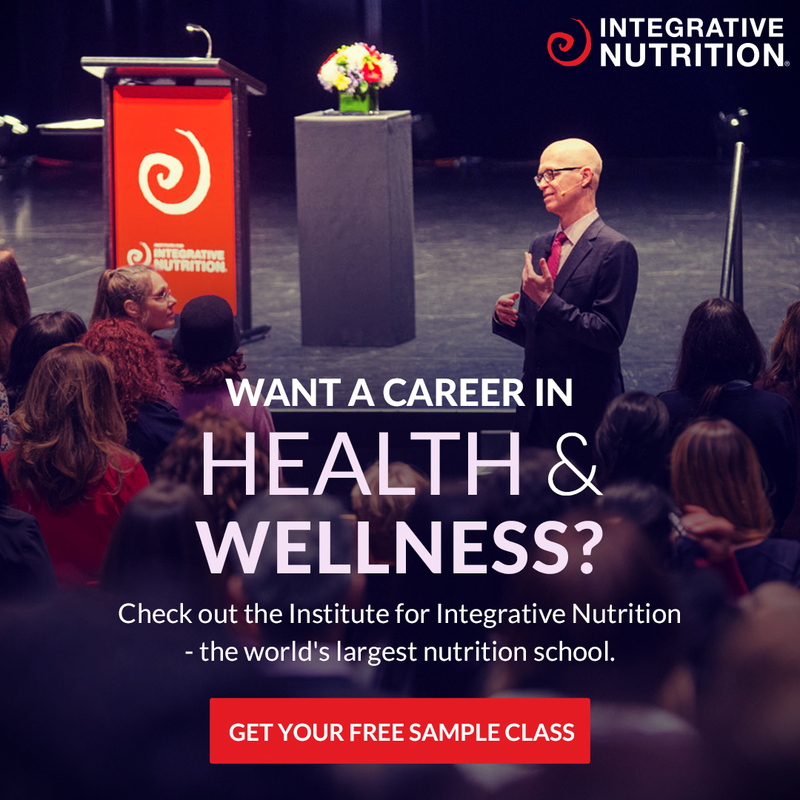 )… so like, technically… it’s not #paleo or #primal approved because they’re high in starch with a Glycemic Index of around 54… BUT because we ACTIVATE the seeds/pseudocereals (yes, buckwheat is a pseudocereal) it’s MUCH easier for our bodies to digest! Yeah yeah yeah for that! PLUS it tastes bloody yum… and sometimes you just WANT A PIECE OF TOAST WITH YOUR SOUP! Whoops caps, no, we meant to yell that. I loooooove this recipe!! I made it a couple of weeks ago and was nervous about how it would turn out but it was awesome… this ones definitely a keeper. Thanks girls! Ps. I’ve paid $15 for a loaf of sprouted bread in the past. Now I make it for about $5 and it tastes way better! We’ve decided to start experimenting with a couple of slices a week… and guess what?! Our bodies actually feel AWESOME… digestion? Never better! 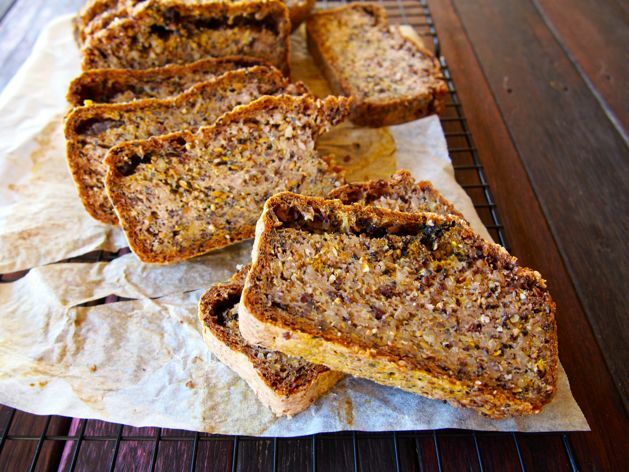 So we’re giving this Healthy Easy Sprouted Bread Recipe a merrymaker tick of ‘eat occasionally’ approval! Extra water to soak your seeds/grains! In a large bowl place the buckwheat, quinoa and flax, cover with the extra water and allow to soak overnight. Preheat oven to 170°C (340°F) and line two 20 x 15 cm (8 x 6 inch) loaf tin with baking paper. Drain all of the seeds, it will be a little 'gloopy'. Now rinse them really well. Good job! In a food processor (we used our Vitamix) place 1 cup of water and all the drained/rinsed seeds. Blend on low speed until it comes together. Add the salt, chia, nigella, turmeric and salt. Blend again until it becomes thick and combined. Some seeds will still be whole, that's ok, in fact, that makes it nice and crunchy! Transfer the mixture in to the prepared tins and in to the oven for 3 hours (yes, we said 3 hours!). We like to toast our bread to make it extra crunchy and serve with smashed avocado, salt and pepper! Yum! But like, anything you want to eat with bread... this recipe is good for! Boom! 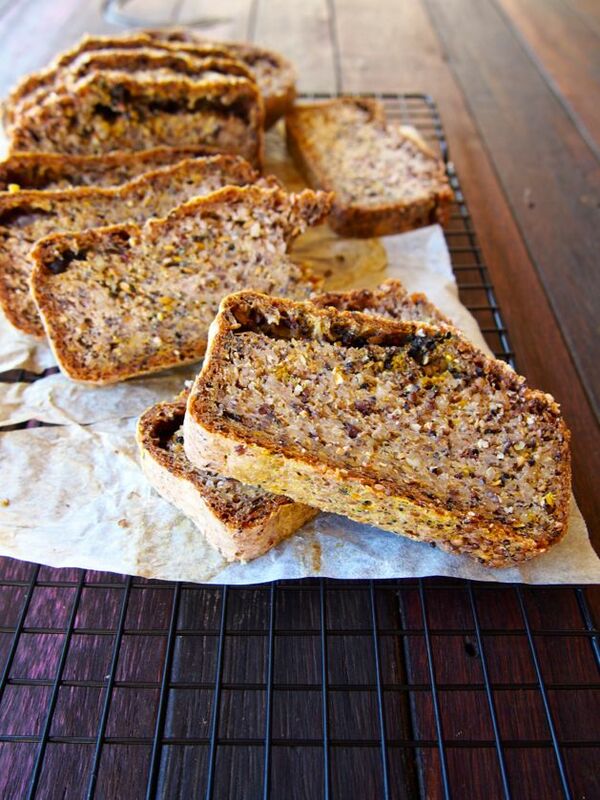 We developed this delish healthy sprouted bread recipe as part of our SupaMerry campaign!